The Chillow® is a patented personal water cooled pillow pad, designed to be placed on top of your existing pillow or for use under your pillow case. Only 1/2″ inch thick this non-toxic, non-gel pad requires no power and needs no refrigeration. Simply fill your Chillow with warm tap water, remove the air, following instructions provided, let sit for a few hours and your ready to enjoy the cooling sensation of your new Chillow. The water is fully absorbed into the Chillow’s patented non-toxic antimicrobial inner foam core creating a soothing gel like feel. The Chillow has been seen on the Dr. Oz Show, Rachael Ray Show, Oprah, Good Morning America, The Today Show. 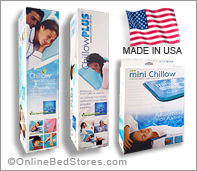 The Chillow’s cooling sensation helps relieve headaches, sunburn, fevers, night sweats, hot flashes, back pain and more. Provides comfort for chemotherapy, MS and Fibromyalgia sufferers. Once activated, it will keep cool night after night, so it’s always ready for use whenever you need it. No wet, damp ice packs to deal with, your Chillow is always dry and cool. The Chillow comes in three models. The Chillow Plus with 2 sided cooling, comes with 6 pairs of velcro stick on fasteners, creating an optional stay in place cooling chillow wrap that can be used around arms and legs. The Original Chillow with flocking on one side and cooling on the other side, prevents slipping when placed inside your pillowcase. The Mini Chillow, is a smaller version of the Chillow Plus, great for traveling and kids love them! Makes a great gift! When completely filled the Chillow weighs 5 lbs. and the mini chillow weighs only 2 lbs.10oz. The Chillow has a 30 day warranty against manufacturer defects in the material and/or workmanship and that the seals/seams will maintain their integrity. Chillow Pillow Pad, Original Chillow, Chillow Plus, Mini-Chillow. Made in The USA, Free Shipping.